Performers include: Erin Krakow, Daniel Lissing, Lori Loughlin, Chelah Horsdal, and Martin Cummins. Based on books by Janette Oke, this historical drama revolves around Elizabeth Thatcher (Erin Krakow), a young teacher who’s been accustomed to high society life. Her life changes dramatically when she receives her first classroom assignment in Coal Valley, a small coal mining town where life is simple, but often fraught with challenges. Abigail Stanton (Lori Loughlin) is a wife and mother whose husband (the foreman of the mine) and a dozen other miners have just been killed in an explosion. The newly widowed women find their faith is tested when they must go to work in the mines to keep a roof over their heads. 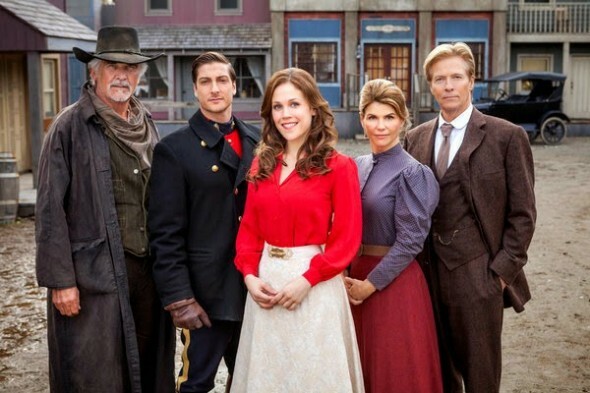 Elizabeth charms most everyone in Coal Valley — except Constable Jack Thornton (Daniel Lissing). He believes that her wealthy father has doomed the lawman’s career by insisting he be assigned in town to protect the shipping magnate’s daughter. Living in a 19th century coal town, Elizabeth must learn the ways of the frontier if she can ever hope to thrive in the rural west on her own. What do you think? Do you like the When Calls the Heart TV series? Do you think it should be cancelled or renewed for another season? I commend Hallmark for holding true to their family values station. At least I have always felt that way about their shows. I do miss When Calls The Heart. I feel for the rest of the cast that is now out of work. Maybe the best idea is to find an actress that looks similar to Lori and have her pick up where the show left off. I love when calls the heart and I would love to see it continue. Please put When Calls the Heart back on! It is one of the few shows I watch regularly and can be confident that it will not conflict with family values that I cherish! Since you have removed Lori Loughlin from the series, I am confident that the writers you use are capable enough of rewriting the stories without her character. The show is too good to allow it to lapse altogether. Everyone makes mistakes none of us are perfect. You should not make everyone pay for a mistake made. Perhaps everyone should stop watching the Hallmark channel to get the point across. I am disappointed that you have taken When call the heart off. Very disappointed in your choice to not air this program. I love When calls the heart and see no need to cancel this series. Please do not cancel ” When Calls The Heart” I am a fan of Hallmark Movies and Mysteries, I so appreciate your family values. Their are not to many channels I can watch because of there content. Thank you Hallmark for being the #1 channel I can count on. This series has got to be wonderful. Please do not cancel the series. With today’s, not so good selection, of great shows, this show is needed to shine thru the muck and mire. Please do not cancel When Calls the Heart. I enjoy this program so much that I will stop watching the hallmark channels if it goes off! The cast is unbelievable and the writing is just as great. We need this type of tv to enjoy watching with all the bad tv out there. leave for whatever reason won’t hurt the finished product! They can be replaced or eliminated and keep the train rolling down the track. You have many great hallmark actors that can get the job done.